Just wondered if anyone has found any 75mm backing pads with an 8mm bolt that would fit my machine. I am hoping the Flex XFE 7-12 80s might fit? I was told that maybe the Rupes LHR75 Mini plate might fit, but I think that takes a 6mm bolt? Alternatively could one cut down a 6” plate on a lathe? , but that looks pretty problematic to me. Not to mention getting rid of all the plastic swarf one might find entrapped in the hook and loop material . The LHR75 plate could be bored out to fit the larger bolt but it’s a really light backing plate. I did this and put it on a Duetto and the vibration was horrible. You may have the same problem if you shave a stock one down. You may have to worry about spacing/clearance issues with another companies BP also. I did see this Flex one looking around and it appears similar, possibly. To describe the feel of a large tool with a tiny backing plate and pad under it and then buffing horizontal panels. Not so bad when buffing vertical panels BECAUSE at this point you are forced to support the weight of the tool anyways AND then push the tool towards the panel. To me, to put a 3" backing plate on a large tool like the Makita PO5000C would definitely make it tippy. I can check and see if the backing plate on a FLEX 3" Mini Polisher will attatch to the Makita? Thanks to all the respondees. Much appreciated. My tardy replies are not lack of interest. But because I just had a pretty tricky back operation. I have to pick my moments! I looked at the LHR as a possible bore out job. I agree cutting down composite pads also looks like it could give problems. The Flex pad you linked looks hopeful. Odd its not red ... as it says its a direct replacement . I was looking at the red pad Order no. 454.141. However I noticed there seem to be a few members with problems on these pads disintegrating! Maybe the one you linked which is black is of upgraded quality. I too wondered about the “tippy” effect. But hope I can cope with it. The majority of the car will be done using the 6” and if I can get one the 5” pads. This is really just for around the front bumper, Led running / fog lamps and air intake grill things. The only alternative would be to buy a Flex XFE 7-12 80 ..... and thats hard to justify along with a Makita for maintaining one car. I would be extremely grateful if you could check out tne xfe 7-12 80 backi g pas on a PO5000C . It would be good to know if the securing bolt is 8mm. I would also like to know what is the direction of rotation on this 7-12 80? I ask becuase the centre on the Makita looks like a spring washer. The relevance being I noticed on the Makita the direction is counter clockwise (viewed from the top, say as it is used). I am wondering if Makita used a sort of spring steel disc where the bolt clamps up ... to counteract the rotation effect undoing this bolt. Last thing one needs is the pad and the bolt flying off as you perfect the bonnet! 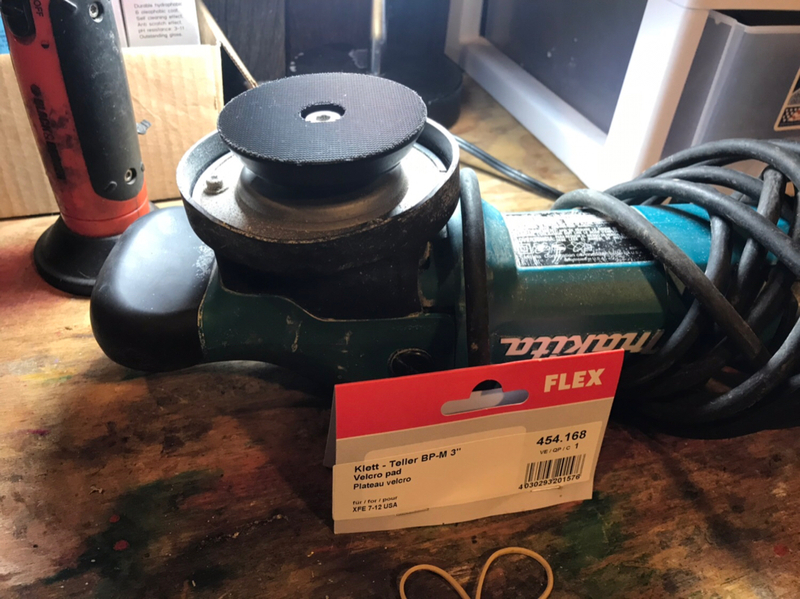 Did you have any luck fitting the Flex 3” mini to the Makita? Yes. The 3" backing plate that comes with the FLEX 3" Mini Polisher will fit onto the Makita PO500C and the bolt that holds the Makita backing plate will also hold on the FLEX backing Plate. I also check the RUPES 3" backing plate for the RUPES Mini - it will fit on the Makita PO5000C but the center hole on the backing plate is too small for the Makita bolt to fit through, so you would have to waller her out. Thanks Mike you are a Star! when you say the Flex mini polisher. I assume you mean the DA XFE 7-12 80 . Other Question, if I find it too tippy or the Makita body is too big, to get access . Do you think the PE 8 -4 80 being a Rotary is a little dangerous for Newbie ? I was just a little concerned that its min speed was 1,300 rpm ( but I appreciate it is a very small pad.). a) having no throw, it might be easier to get around and tight up to grills and running lights and b) yes its a fair bit cheaper. But if you think its a lot more dangerous then I woukd take your advice. Note I will only be doing final fine finishing no compounding.